Zoning is a funny thing. It’s the invisible hand that sculpts our cities. It’s the rulebook that governs private development—dictating what and where and how things are built. All too often, it’s the arrogant czar who proclaims “Nyet!” when a developer wants to build a place for people and pedestrians. Simply put, zoning has the power to make or break a place. But the topic is so boring, nobody wants to think about it. Yet zoning—that dry, humorless, sleep-inducing code—is essential to the health of a city and the people who call it home. If you’ve ever wondered why you can’t walk to the places you need to go, why parking lots have become the dominant architectural feature of our cities, or why there isn’t a coffee shop or a bakery in your neighborhood—congratulations! You’ve just discovered zoning! Tulsa is currently performing a comprehensive update of its zoning code for the first time since 1970. Like bell-bottom pants, pet rocks, and 8-track tape players, our zoning code should have been shelved decades ago. Instead it’s been dutifully chugging along: prioritizing automobile travel over every other option, punishing pedestrians and transit users, and turning our city into a giant parking lot. Hopefully, change is on the way. If you’re happy with the status quo, let’s see if a quick example can change your mind. Take a look at the Office Depot at the corner of 15th and Lewis, which was built in 2004 on the site of an old grocery store. In the current zoning code, this is considered “Shopping Goods and Services,” and the super-scientific-sounding code calls for 1 parking space per 225 square feet of building. Since the Office Depot building occupies 22,264 square feet, our zoning code (perhaps imagining a desperate run on staplers and toner cartridges) requires 99 parking spaces. Important note: No one in the history of parking has ever actually parked behind this store. 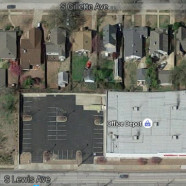 In the proposed update to the zoning code, this location in the historic Gillette neighborhood would be considered “urban” and would receive a reduction in the amount of required parking. The proposed zoning code would require 1 space / 300 SF of building, equaling 74 required parking spaces. The amount of land that could have been saved by the proposed new code is shown in red below. Had the proposed zoning been in place years ago, it could have prevented the demolition of a historic home without impacting the success of the store. Why do you care? Because each 7,275 SF lot that was converted to surface parking for this store currently generates about $1,587 in property taxes. Compare this to the remaining homes along Lewis Avenue which generate, on average, $2,626 in property taxes per lot. By NOT destroying one home for parking that nobody will ever use, Tulsans would have received 65% more in property taxes from that land than they do today. That’s money that could have been funding public schools, community college, vo-tech, libraries… basically making the city a better place to live. Or you could have a bunch of asphalt that nobody uses. Excess parking also adds to the cost of retail space because developers must purchase more land than they actually need. Those costs are folded into the price of commercial leases, which are passed on to you, the consumer. Whether you drive to the store or not, you pay for the “free” parking with every purchase. Here’s a better idea. What if we simply eliminated parking minimums from the zoning code? What if we let private land owners determine how many parking spaces were needed for any given development? This wouldn’t eliminate parking, it would simply give developers the right to decide for themselves how much parking they really need. Plus, in the age of Amazon Prime and online shopping, excessive parking requirements create a competitive disadvantage for brick and mortar stores. Every parking space adds to the cost of overhead. Meanwhile—in an ironic twist—the need for off-street parking is probably already decreasing due to the increase in online sales. A wise developer would encourage transit use, cycling and walking because conserving land—wasting less land on unnecessary parking—means lower costs and/or more space available for buildings that actually generate income. So, what’s an easy way to encourage walking, biking and transit for little or no cost? It’s pretty simple, really. By eliminating parking minimums and bringing the building up to the corner where it belongs, we just preserved FOUR historic homes (increasing the tax base by 65% on each lot), while maintaining an ample supply of off-street parking for the store. There’s even space for a generous landscaping buffer between the parking lot and the residential uses. We’ve also increased the visibility of the commercial building by locating it at the corner of a busy intersection. All of this can be achieved while making the city a better place for people. It can be done through zoning. Which maybe isn’t so boring after all.